In response to the catastrophic earthquake that hit central Mexico on 19 September, AMDA has sent a nurse/coordinator to Mexico City. After arriving in the capital on 22 September, the nurse is schedule to meet up with the staff from Tenrikyo’s local office. 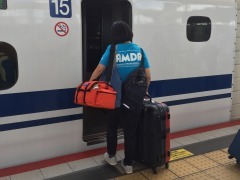 Earlier this month, Tenrikyo’s Mexico branch had just finished working with AMDA on the disaster relief for the quake that devastated the country’s southwest. According to UNOCHA, the death toll across five states has risen to 217, of which 86 of them were killed in Mexico City. It was reported that at least 45 buildings have been collapsed in the city alone. The quake affected medical facilities as well. While hospitals have been trying to maintain their daily operation despite some level of building damage, 39 hospitals were severely affected throughout the country. Mexico has been facing extensive power outage which has affected 38 million people as a whole. It may take time until the power comes back on.